Happy New Year from Chasing Aphrodite. It’s been a year and a half since our book was published, and during that time the hunt for looted antiquities at the world’s museums has gone global. Over the past 12 months we’ve revealed new information about objects looted from Turkey, Cambodia, India, Latin America, Italy and beyond. Visitors from 150 different countries came to read our weekly posts. (Those interested in a daily feed of relevant links and commentary should like us on Facebook or follow us on Twitter.) Our focus here is on scoops, and over the past year we broke several significant stories about the illicit trade, some of which led to the return of looted antiquities to the countries from which they were stolen. The year started with a bang in January with the arrest Arnold Peter Weiss, a prominent Rhode Island surgeon and collector of ancient coins who was arrested at the Waldorf-Astoria Hotel in New York City for felony possession of allegedly ancient coins that had been recently looted from Sicily. Our scoop a few days later revealed that Weiss had told a confidential informant that he knew he was dealing in looted coins: “There’s no paperwork, I know this is a fresh coin, this was dug up a few years ago,” he said, according to the criminal complaint. We later traced Weiss’ donations to RISD and Harvard University Art Museums; revealed his business partner’s connection to the Getty; exposed the role of federal investigators in the case; and covered his guilty plea to selling what turned out to be clever fakes. Almagia Returns: In January we also wrote about American museums returning a new wave of looted antiquities to Italy after the objects were tied to the criminal investigation of Italian antiquities dealer Edoardo Almagia. The Met returned more than 40 vase fragments from the private collection of its former antiquities curator Dietrich von Bothmer. The Princeton Museum returned 160 objects and fragments, and stonewalled questions from the press about those returns. 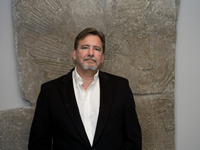 (The museum’s curator Michael Padgett, above, has been named as a target of the investigation.) 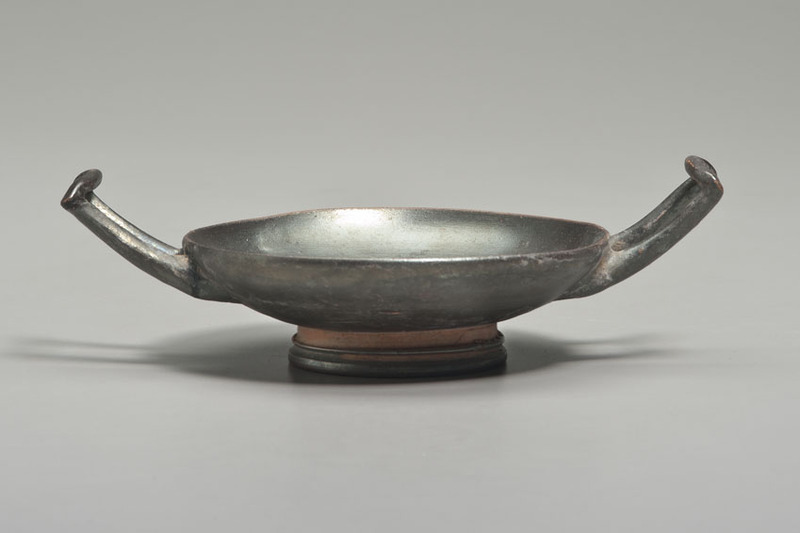 In February we began tracking objects museums had acquired from Almagia and found several at the Dallas Museum of Art. We also traced Almagia objects to the Boston MFA, the San Antonio Museum of Art, the Indiana University Art Museum and the Getty Museum. David Gill identified one additional Almagia object at the Tampa Museum. The Dallas Museum announced in December that five of the objects we had questioned would been returned to Italy. Turkey’s claims: In March, we broke the news that Turkey was seeking the return of dozens of allegedly looted antiquities from American museums. We also listed the specific objects being sought at those museums, including: 10 objects at the J. Paul Getty Museum; 18 objects from the Schimmel Collection at the Metropolitan Museum of Art; 21 objects at the Cleveland Musuem of Art; and the Sion Treasure at Harvard’s Dumbarton Oaks. Since then, the Dallas Museum of Art has already agreed to return a looted mosaic to Turkey, and Bowling Green State University has signalled its intention to do the same. Negotiations with the other institutions are on-going, and we expect to have an update soon. Cambodia vs. Sotheby’s — The Battle for Koh Ker. In April, we began following the legal battle between the US government and Sotheby’s over a 10th century Khmer statue allegedly looted from a temple complex deep in the Cambodian jungle. Government prosecutors, suing on behalf of Cambodia, alleged that Sotheby’s knew the statue was looted and and withheld the information from potential buyers, as well as government investigators. The auction house has denied those claims. Damning internal emails, however, revealed Sotheby’s knowledge about the statue’s suspect origins and the likely controversy its sale would cause. Also named in the case is a companion statue now at the Norton Simon Museum in Pasadena, whose feet remain in situ in Cambodia. The man at the center of the case is Douglas Latchford, a British collector/dealer based in Bangkok whose name has been linked with sever pieces of suspect Khmer antiquities. In recent months we’ve traced Latchford’s objects to the Denver Museum of Art, the Kimbell Museum and the Met. The outcome of the case could prove an important precedent for legal claims against looted antiquities in the United States. 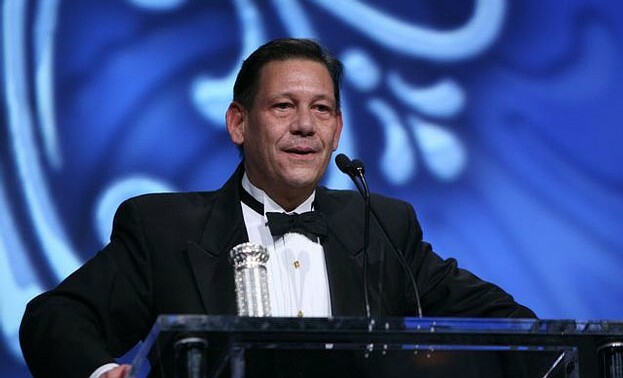 Jim Cuno’s shakeup at the Getty: In May, the board of the J. Paul Getty Trust hired James Cuno to lead the organization. It was an odd choice — The Getty was still recovering from a devastating international scandal over its acquisition of looted antiquities, and had enacted a new acquisition policy that respected foreign ownership laws. 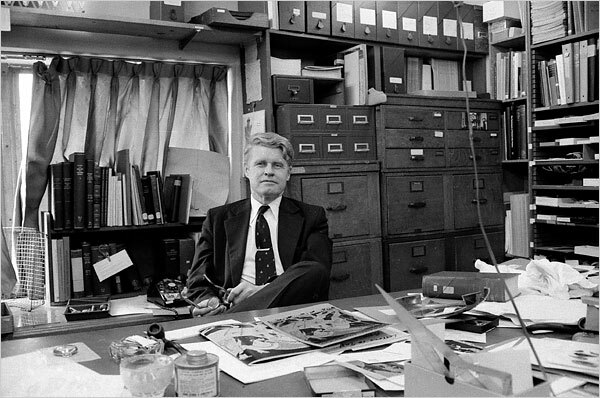 Cuno had long been a vocal critic of those laws and advocate for the type of unfettered collecting that had gotten the Getty into trouble. 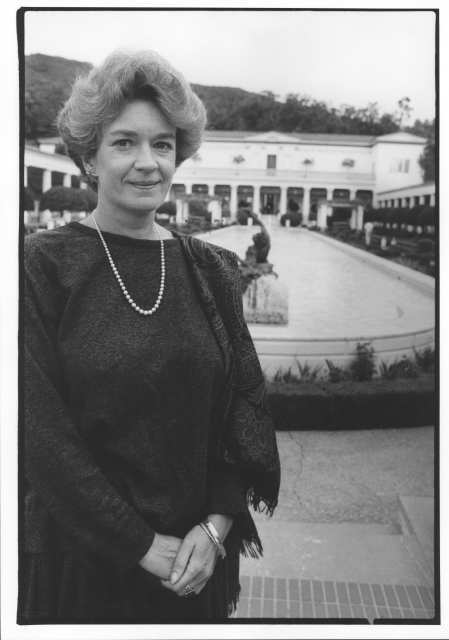 One of Cuno’s first moves was the elimination of 34 positions at the Getty Museum, including two respected veterans and 12 professional gallery teachers who were replaced by volunteer docents. We broke the news, published Cuno’s memo to staff and covered the fallout. 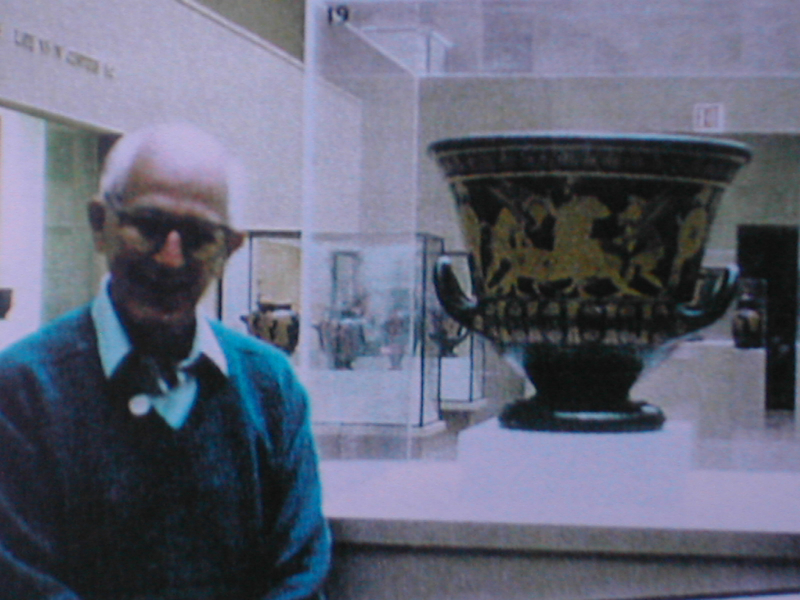 We also wrote about his decision to hire Timothy Potts, another advocate of unfettered collecting, and raised questions about Pott’s acquisition of a 5th century BC Greek cup at his previous post, the Kimbell Art Museum. 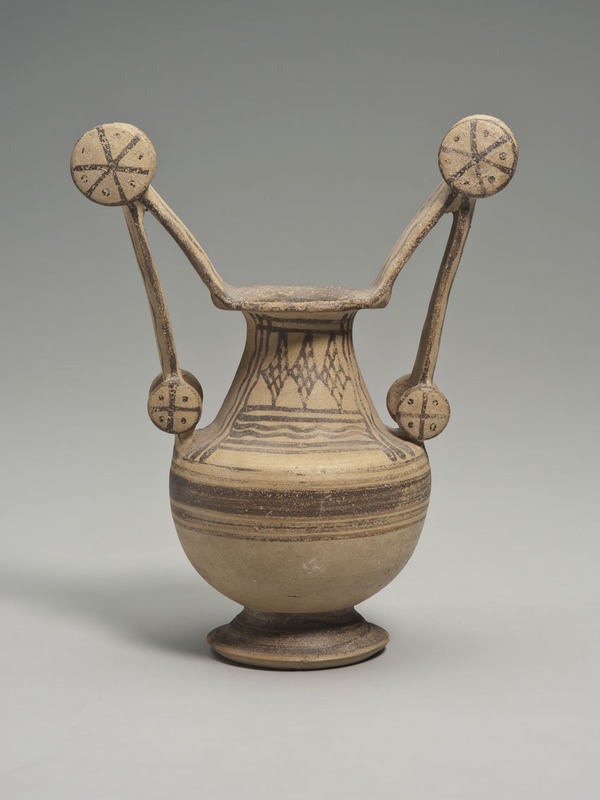 In response to our questions, the Kimbell announced they would post the vase on the AAMD’s registry of ancient objects with unclear ownership histories. They never did. The Bourne Collection: Also in May, we featured a guest post by Roger Atwood on the Walter’s newly acquired collection of unprovenanced Pre-Colombian Art. Atwood described the “long and checkered history” of the Borne collection, which is sprinkled with fakes and at least one piece suspected of having been looted from Sipan, Peru. Subhash Kapoor Case: In July we began writing about the investigation of Subhash Kapoor, the New York based antiquities dealer specializing in Indian antiquities and temple idols. After federal agents raided his New York warehouse, we identified more than 240 objects acquired from him in museums around the world. In December, federal investigators announced they had seized some $150 million in antiquities from him and consider Kapoor “one of the most prolific commodities smuggler in the world.” The case is on-going. This Polaroid seized from the warehouse of dealer Giacomo Medici shows the Getty Museum’s Statue of Apollo shortly after it was looted from a tomb in Southern Italy. WikiLoot: Finally, this year we announced our plans to crowd-source the study of the black market in looted antiquities. We’re still in the development phase of the project — raising money, building partnerships and considering the structure of the site. But WikiLoot, as we’re calling the project for now, has already attracted substantial interest and media attention from the Guardian, the Economist, CNN, the Australian Broadcasting Corp. and others. This spring we’ll be developing a prototype of the site and reaching out to more potential partners. Stay tuned for updates. Thanks for reading. Our best wishes for 2013, and we hope you will join the hunt! Almagia Objects Traced to Boston MFA, San Antonio Museum, Indiana University. 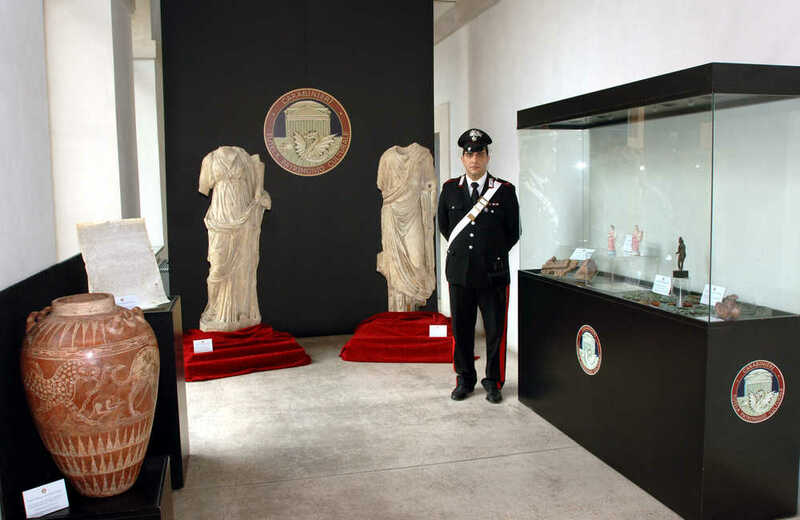 We’ve heard back from more museums about objects they acquired from Edoardo Almagia, the Italian dealer at the center of an investigation into the illicit antiquities trade. As we’ve reported previously, the Met and Princeton University museums have recently returned more than 200 Almagia objects and fragments to Italy, some of which may be used as evidence in the criminal trial of Almagia and Princeton antiquities curator Michael Padgett. Italian investigators have also traced the dealer’s objects to the Dallas Museum of Art, and we found one at the Getty. We can now provide details about Almagia objects at three more American museums. The Boston Museum of Fine Art has ten objects tied to Almagia, nine of which were impasto vases acquired in 1995 as donations from Jonathan Kagan, a prominent investment manager. Prior to Almagia, the objects were “said to have been purchased in Basel.” An old Swiss collection there, no doubt. A decade before donating the Almagia objects to the Met, Kagan was reportedly behind the sale of the Elmali Treasure, a vast hoard of ancient coins allegedly looted from Turkey. The tenth Almagia object at the Boston MFA is a lovely Roman bust of an old man made of Carraran marble from northwest Italy. The museum purchased the bust directly from Almagia in 1991. It has no documented ownership history. Details of all the Almagia objects in Boston can be found in the MFA’s release here. None of the 13 objects returned by Boston in 2006 came from Almagia, Kantrovitz added, though the bust shown above was among the objects discussed during negotiations. The San Antonio Museum of Art purchased two Greek vases from Almagia in the 1980s. The first (above) is a red-figure Oinoche depicting Dionysos and a satyr attributed to the Florence Painter. The museum also has 54 vase fragments — also said to be from Barbarano Romano — that were purchased from Almagia in 1986 by a local attorney, Gilbert Denman Jr., who donated them to SAMA the same year. None of the antiquities have a documented ownership history. All were acquired under then-curator Carlos Picon, the current antiquities curator at the Metropolitan Museum of Art. As David Gill has noted, Picon also knew Giacomo Medici and has described being touched by the generosity of the convicted antiquities trafficker. It will be interesting to know more about the relationship between Picon and Almagia as the Italian investigation unfolds. SAMA director Katie Luber said in a statement that the museum reached out to Italian authorities about the Almagia objects on February 17th, two weeks after first being contacted by us. It has not yet heard back. Meanwhile, Princeton University is refusing to respond to questions about its own ties to Almagia, perhaps because the museum’s antiquities curator Michael Padgett remains the subject of a criminal investigation for his ties to the dealer. Since the University released a vague statement on January 25th, we have sent several follow-up requests for additional information. University spokesman Martin Mbugua has failed to respond to any of them — odd behavior for an educational institution. Thank you for the link, Martin. Can you please provide images and the ownership history for each of the returned objects? Also, please provide a copy of the internal investigation that apparently led to the decision. Can you clarify the release’s statement that Princeton had good title to the objects it returned? If Princeton had title, that would indicate the objects had not been illegally exported from their country of origin. If that is the case, why would the university return them? Finally, are there additional objects in Princeton’s collection that were donated or purchased from Almagia that have not been returned? If so, please provide a list of them with information about their ownership histories. — is the University paying for Dr. Padgett’s defense? — The Met indicated it returned objects so they could be used as evidence in a possible criminal trial. Were the Princeton returns sent back for the same purpose? — Has the University investigated the allegations against Dr. Padgett? If so, what conclusion was reached? I understand that on-going investigations are sensitive matters. My experience is that transparency in these matters is the best way to demonstrate good faith to the public. The Dallas Museum of Art contacted Italian authorities this month seeking information about three objects the museum acquired from antiquities dealer Edoardo Almagia, who is currently under investigation for trafficking in looted antiquities. Almagia has been under investigation since at least 2006, when US Customs agents raided his New York apartment, and was the subject of a New York Times story in 2010 that revealed he and Princeton curator Michael Padgett were the target of an Italian investigation into the illicit antiquities trade. Two Etruscan funerary shields from the 6th century BC depicting the man-bull deity Acheloos. The museum purchased the shields from Almagia in 1998. They were “reputedly in a European collection” prior to sale, but the museum has no additional information about that collection. The DMA’s website notes that “comparable examples have been found stacked up in a tomb near Tarquinia,” a UNESCO World Heritage site whose Etruscan necropolis has been devastated by looting. Volute krater by the Underworld Painter. This Apulian vase from the 4th century BC represents the twelfth labor of Hercules, in which he saved the Golden Apples of the Hesperides from the giant Ajax. We asked the DMA about several other acquisitions of ancient art purchased in recent years, when most museums were tightening their standards in the wake of revelations about their role in the illicit antiquities trade. Several of the DMA’s acquisitions were purchased from dealers or auction houses who have been tied to the alleged sale of looted or stolen art in the past. Most of the objects have only vague ownership histories. This red-figured column krater was purchased in 2008 from Jerry Eisenberg of Royal-Athena Galleries in New York City. It was “reputedly in an English collection” before that. As we reported here, Eisenberg recently returned a bronze statue to Italy that had been stolen from an Italian museum in 1962. UPDATE: Eisenberg noted via email that the vase was also sold at Bonham’s London in October 1999. The museum has purchased several objects from Robert Haber of Haber and Associates, including this 4th Century Greek funerary wreath. Haber was implicated in the Steinhardt case involving a golden phiale illegally exported from Italy. The wreath’s ownership history lists the Moretti collection from Lugano, Switzerland and George Zacos — the same dealer tied to the Met’s acquisition of the Lydian Hoarde from Turkey. We’ve posted the list of all 15 DMA objects we inquired about here. These are just a random sampling of recent acquisitions made by the museum. 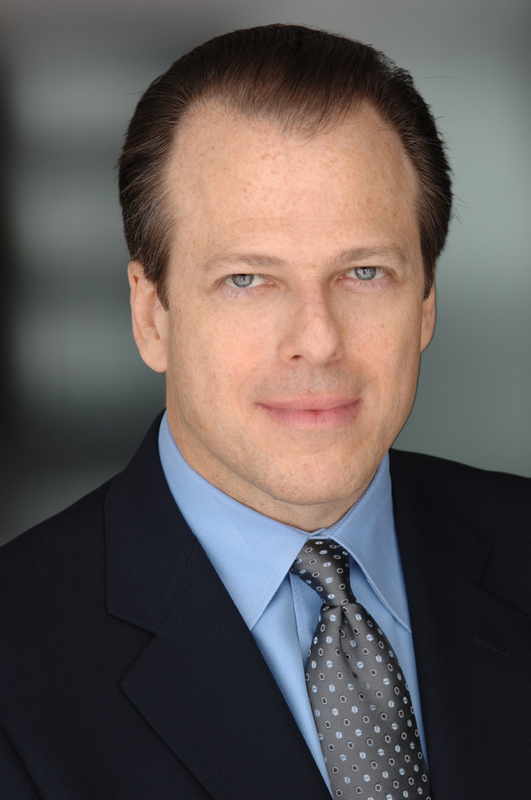 Maxwell Anderson, the DMA’s new director, has been an outspoken advocate for reform in his past positions, and it will be interesting to watch how he handles these issues at his new post in Dallas. For starters, we hope that Anderson encourages Dallas to be more transparent by posting the provenance information for its considerable collection online. Dallas and other museums should also be more proactive in their investigation of the objects purchased from dealers who have been tied to the illicit trade. UPDATE: David Gill at Looting Matters has identified a vase at the Tampa Museum of Art acquired from Edoardo Almagia. It appears similar to a vase described in an article by Princeton curator Michael Padgett in Tampa Magazine. The dozens of vase fragments that the Metropolitan Museum of Art returned to Italy last month came from the private collection of its former antiquities curator Dietrich von Bothmer. They were sent to Italy to be used as evidence in the possible criminal trial of antiquties dealer Edouardo Almagia, a Met spokeswoman said. Von Bothmer acquired his massive personal collection of ancient vase fragments — as many as 15,000 in all — outside of his official duties at the Met, a practice generally frowned upon in museums because it creates a conflict of interest for curators. When von Bothmer died in October 2009, he bequeathed the collection to the Met, which accepted the donation “with the express approval of the Italian Ministry of Culture,” said Met spokeswoman Elise Topalian. 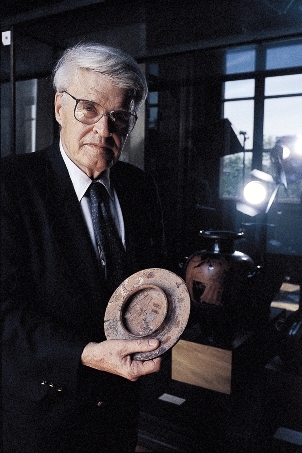 With his photographic memory, von Bothmer had a remarkable talent for spotting fragments missing from Greek vases in collections all around the world, and would often donate his fragments to make those vases more whole. But Italian investigators took a different view of his activities: many of the vase fragments were the product of illicit excavations, they believe, and von Bothmer’s donations seeded the American market with loot. 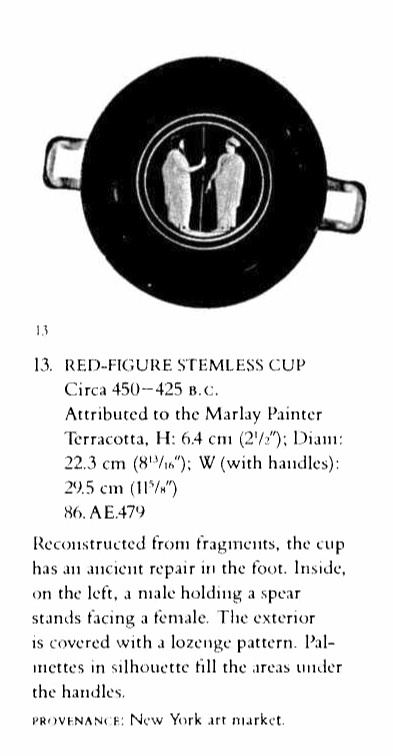 As former Getty antiquities curator Marion True described in a 2001 deposition, once a museum had several pieces of an important vase, antiquities dealers would charge increasingly higher prices for the remaining fragments, in effect extorting museums. In that same deposition, True confided that von Bothmer had shown her the precise location where the museum’s prized vase, the Euphronios krater, had been looted in Italy. Almagia is the antiquities dealer and donor to the Princeton University Art Museum who, along with Princeton antiquities curator Michael Padgett, is under investigation by Italian authorities for trafficking in looted antiquities. As we reported earlier, the Princeton museum also returned 160 objects and fragments to Italy last month, several of which have been linked to Almagia. The returns from the Met and Princeton are the first signs of recent activity in the Italian investigation of Padgett and Almagia, which has been going on since at least 2006, when Almagia’s New York apartment was raided by US Customs officials. They may be used as evidence in another criminal case like that of Marion True, which ended in 2010 with no verdict when the statute of limitations expired. In a Jan 20 press release, Italy’s Carabinieri art squad described the seizure of “copious documentation with photographic material pertaining to sales and loans made ​​by [Almagia].” Using those documents, Italian investigators say they have traced works from Almagia to the Museum of Fine Arts, Boston; the Cleveland Museum of Art; the Dallas Museum of Art; the San Antonio Museum of Art; the Toledo Museum of Art; the Tampa Museum of Art; the Indiana University Art Museum, according to the New York Times. NOTE: Princeton and the Met gave different figures for the number of objects returned than those cited earlier in the week by Italian authorities. Princeton said it returned “six works,” while the Italian release described 160 objects and fragments coming from the museum. The Met said it had sent back “20 fragments (or groups of fragments)” while Italy put the number at 40. The numbers likely reflect different ways of tallying incomplete objects and efforts on all sides to spin the significance of the returns. SPEAKING OF SPIN: Princeton University has released a statement about the returns. The statement calls the returns evidence of “the museum’s history of successfully resolving ownership claims for works of art in its collections.” Another reading: they’re evidence that the museum — after revising its acquisition policy in 2006 and returning eight antiquities in 2007 — has still not resolved questions about its possession of looted antiquities. The release says the returns to Italy were initiated by the University after “an internal University analysis related to several items in the museum’s collections.” That analysis has not been released publicly and Princeton is silent about the link to the on-going investigation of Almagia and Padgett, the museum’s antiquities curator. Our request for additional information has not been answered. We hope Princeton will be more forthcoming in the future.